Hello again, Ramin Rak here, welcoming you back to my blog. As a spine and brain specialist, I deal with an increasingly large number of patients who suffer from traumatic brain injury, or TBI. Ramin Rak recommends seeking medical help if you experience any of these symptoms taking a blow to the head. According to the CDC, TBI contributes to a substantial number of deaths or permanent disability annually. A TBI occurs when an individual experiences trauma to the head that disrupts the brain’s normal function. The severity of a TBI can vary from mild to severe, but experts like myself encourage patients to treat all forms of TBI very seriously. Loss of cognitive function, such as memory and attention. Loss of motor function, including weakness and poor coordination. Sensation; for example impaired perception, hearing, or vision. Emotional changes, including depression, aggression, and lack of impulse control. The consequences of a severe TBI can affect an individual’s life, but there are steps that can be taken to limit the injuries impact. The CDC recommends primary intervention, early management, and treatment of severe TBI for best results. Learn more about me, Ramin Rak, and my unique skill sets here: http://www.linkedin.com/in/raminrak, and here http://raminrak.com/ramin-rak-traumatic-brain-injury-treatments/. Hi all, Ramin Rak here with another blog post about a complicated neurosurgical procedure I perform at Neurological Surgery, P.C. : aneurysm coiling. I primarily treat conditions in the brain and spine so I only perform aneurysm coiling to address brain aneurysms. Endovascular aneurysm coiling is one of two techniques (along with open surgical clipping) that can be used to treat brain aneurysms, but sometimes a physician will choose to closely observe an aneurysm instead of recommending one of these two treatments. Aneurysm coiling is a minimally invasive endovascular procedure performed to treat an aneurysm, which is a balloon-like bulge of an artery wall (learn more). As an aneurysm grows, it will thin and weaken until it becomes so thin that it leaks or ruptures. A ruptured aneurysm will release blood into the space around the brain, called a subarachnoid hemorrhage, and is life threatening. Treatment involves stopping blood from flowing into the aneurysm but still allowing blood to flow freely through the normal arteries. While open surgical clipping accomplishes this from the outside, aneurysm coiling does so from the inside. I begin the procedure by giving the patient anesthesia while they are on the x-ray table. 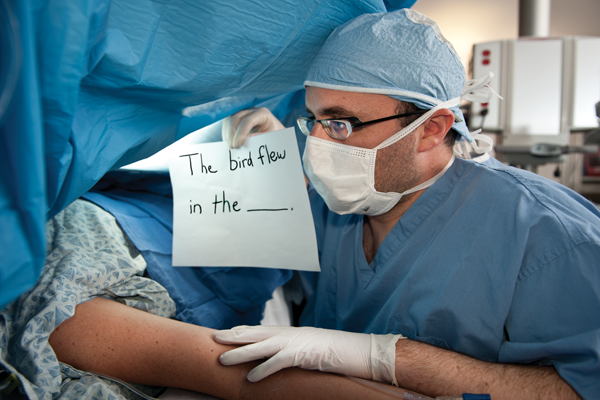 Next, I locate the femoral artery and use a needle to insert a long plastic tube (the catheter) into the bloodstream. Dye is then injected through the catheter to make blood vessels visible on my x-ray monitor, allowing me to guide the catheter to one of four arteries in the neck that lead to the brain. After the catheter is placed, I take x-ray photos and use them to take measurements of the aneurysm. 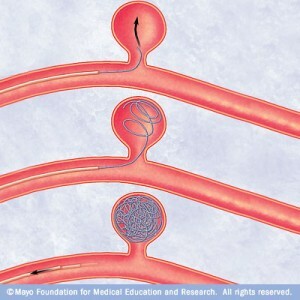 A second smaller catheter travels through the first catheter and makes its way to the aneurysm itself. Small platinum coils are then passed through the catheter until they emerge in the aneurysm, and this process continues until the aneurysm is completely packed with coils. I then inject contrast agent so that I can confirm that blood is no longer flowing into the aneurysm and finally close the puncture site in the artery. Endovascular aneurysm coiling has a long-term success rate between 80 and 85%. Learn more about my specialized neurosurgical procedures on Brand Yourself: http://raminrak.brandyourself.com/ or visit my WordPress blog. Hi all, Ramin Rak back again with another blog post about my work as a neurosurgeon with Neurological Surgery, P.C. I specialize in treating disorders related to the brain and spine, and frequently treat benign and malignant brain tumors with the NSPC Brain Tumor Center. One way that I treat these tumors is by performing stereotactic radiosurgery. Stereotactic radiosurgery is a form of radiation therapy where high-powered x-rays are focused on a small area of the body where a tumor is located. This procedure not only does a better job of targeting the specific area where the tumor is located but also is safer because it is less likely to affect surrounding tissue. Certain types of stereotactic radiosurgery, such as the Cyberknife and Gamma Knife procedures, require the use of a fitted face mask or frame that goes over the scalp. Despite its name, stereotactic radiosurgery is not a surgical procedure. This treatment is intended to shrink tumors solely by using targeted radiation. I recommend this option for individuals with small, deep tumors that would be hard to remove during surgery as well as individuals who are unable to have surgery, such as the sick or elderly. During this procedure, the patient will lie down on a treatment table, which then slides into the treatment machine. Radiation is applied in sessions that last between 30 minutes and one hour. Usually no more than five treatment sessions are necessary, but the exact number of needed sessions will be determined based on the type and size of the tumor. While it is most common for stereotactic radiosurgery to be used for non-surgically addressing tumors, it can also be used following surgery to remove abnormal tissue left behind following surgery. If you have any questions about stereotactic radiosurgery or other complex brain and spine procedures, check to see if I have addressed them on my Quora. Hi all, Ramin Rak here with another blog post about the complex neurosurgical procedures I complete at Neurological Surgery, P.C. I specialize in the completion of surgeries meant to treat ailments affecting the brain and spine. In previous blog posts I have discussed my work with the NSPC Brain Tumor Center and spinal procedures such as Spinal Fusion and the X-Stop Procedure. One spinal procedure that I have not written about is a microdiscectomy. When a patient complains of leg pain I can use magnetic resource imaging (MRI) or a computer tomography (CT) scan to determine if the patient has a herniated disc. Using these results, I then decide whether or not a microdiscectomy will relieve the patient’s symptoms. This spinal procedure is primarily used to treat leg pain, specifically leg pain arising from a herniated lumbar disc. Compression or impingement on the nerve root, defined as bone colliding with or striking the nerve root, will cause considerable leg pain. A microdiscectomy is used to relieve leg pain, and in many cases the patient will feel relief immediately after completion of surgery. When completing a microdiscectomy, I examine the disc and nerves under a high powered microscope so that I only need to make a small incision. By using this microneurosurgical technique instead of performing a discectomy, patients experience a much smaller recovery time because there is less tissue damage. After the incision is made, I move the back muscles off of the bony arch (lamina) of the spine. I am then able to enter the spine by removing a membrane over the nerve roots and visualize the nerve using operating glasses. Once herniated disc material is removed, the procedure is complete. For more information about the types of spinal procedures I have completed, take a look at my other blog posts or view some of the surgical videos I have uploaded to Vimeo by clicking here. PS For more information on the completion of a microdiscectomy, visit this link. Hello again, my name is Ramin Rak and I am writing this post to share information about another complex spinal procedure that I perform at Neurological Surgery, P.C. : Kyphoplasty Surgery. I perform kyphoplasty surgery in order to reverse spinal compression caused by a spinal bone fracture. Individuals who experience compression lose vertebral body height and experience intractable pain. Fortunately kyphoplasty surgery removes pain relief roughly 48 hours after completion of the procedure, and patients can leave the hospital on the same day the procedure is completed. Once the patient has been sedated, I make a small incision in the patient’s back so that I can insert a narrow tube-like needle into the fractured vertebral body. I then use an imaging technique called fluoroscopy, which uses x-rays to provide a real-time moving image of the patient’s spinal structure, to guide the needle into the fractured area. Once a path has been made to the spot of the fracture, I insert a balloon into the tube, guide it to the vertebrae, and then slowly inflate it. The inflated balloon elevates the spinal structure, which restores vertebral body height. Next I remove the balloon and fill the cavity created by the balloon with a cement-like material that hardens quickly and stabilizes the spinal structure. The entire procedure takes roughly one hour per affected vertebra and following conclusion of the procedure, the patient is observed in the recovery room until my doctors determine that he or she can leave. This is how I complete kyphoplasty surgery at Neurological Surgery, P.C. Learn more about how I complete this procedure by reaching out to me on Doctor’s Hangout. During kyphoplasty surgery, a balloon is inserted into the spine and inflated via a small tube.